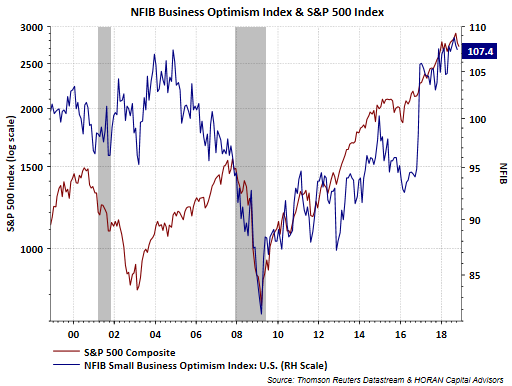 "Small business optimism continued its two-year streak of record highs. Overall, small businesses continue to support the 3%+ growth of the economy and add significant numbers of new workers to the employment pool. Owners believe the current period is a good time to expand substantially, are planning to invest in more inventory, and are reporting high sales figures. Seasonally adjusted, 30 percent of owners think the current period is a good time to expand substantially, citing the economy (72%) and strong sales (14%)." Areas around employment seem to be some of the most significant issues facing small businesses. Given the low unemployment rate this is not much of a surprise. The below chart highlights three components of the survey surrounding some of the employment issues. The bottom panel in the chart (green line) shows one of the most important problems facing businesses is the cost of employment. Of the firms surveyed, 9% cited this as an issue, which ties the record high percentage set back in August 2016. 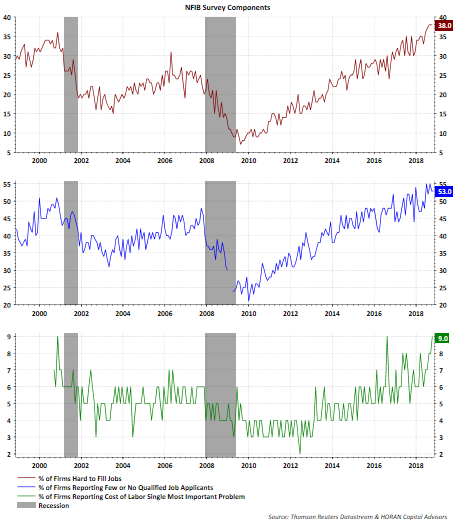 Also at or near a record high is the percentage of firms stating it is hard to fill jobs as well as the difficulty in finding qualified applicants. Small businesses continue to see a strong business environment ahead. These survey results are not indicative of a difficult economic environment ahead.